Although soaking parts has been around probably as long as dishes have been soaked in the kitchen sink, today’s modern immersion processing systems from ACT can take the manual labor, the excessive time, and the fear of soil re-deposition out of the equation. 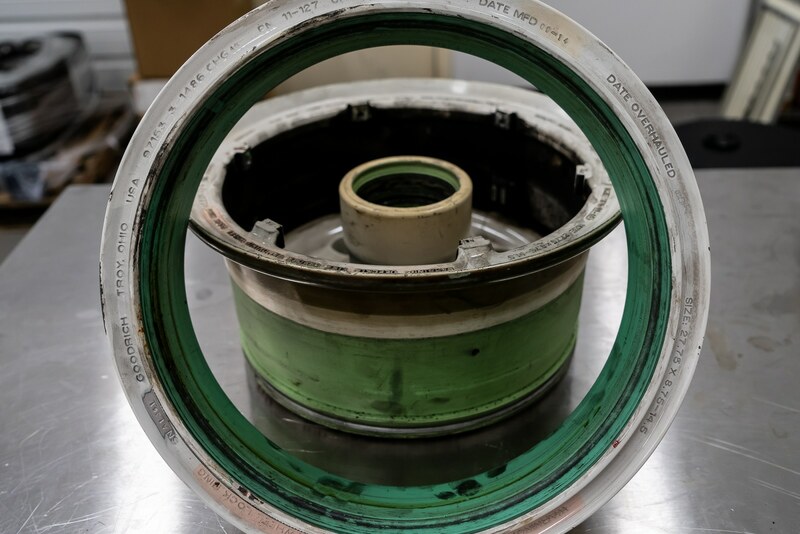 Our immersion parts cleaning systems are much more than just tanks; their process fully submerges the entire surface area of parts to remove the toughest soils and contamination. 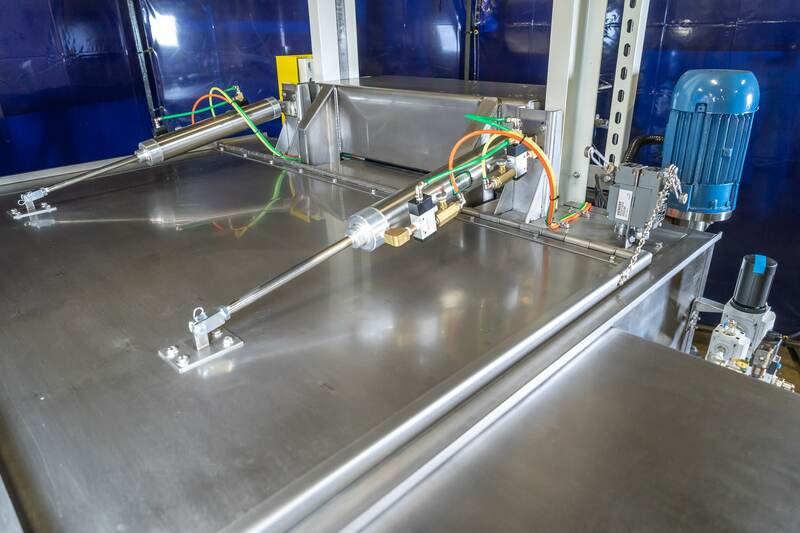 Modular parts cleaning designs can be seamlessly connected to create semi-automated or fully automated immersion parts cleaning lines, while large, application specific systems have been built to clean loads as heavy as 5,000-lbs. We even have proprietary immersion parts cleaning designs in the field delivering 6,000 GPM directly at the part load. Not mixing, but extremely high volumes directed at the workload under pressure! 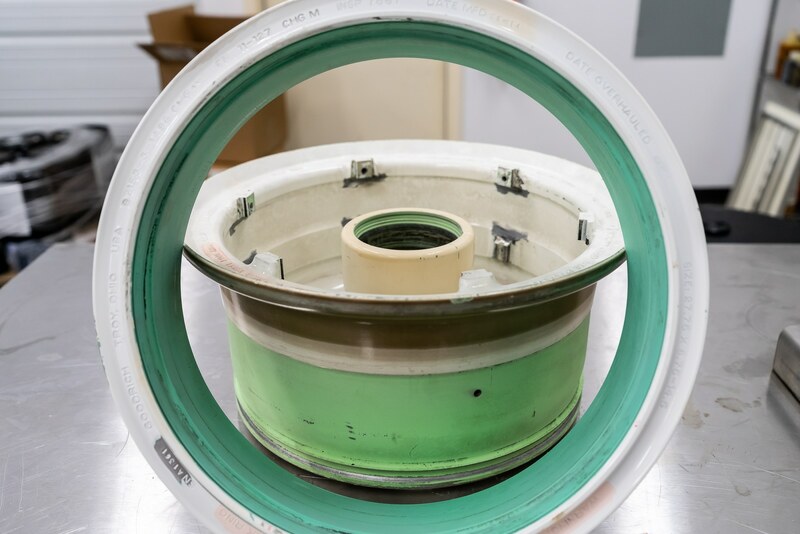 Our immersion parts cleaning systems’ ever-changing flow stream and sequenced timing of cleaning actions is producing cleaner parts, in less time, for customers in aerospace, screw machining, powertrain manufacturing and overhaul, medical device manufacturing, and more. For those that want to move up to the next level, contact us to learn how our immersion processors can deliver the ultimate cleaning results. 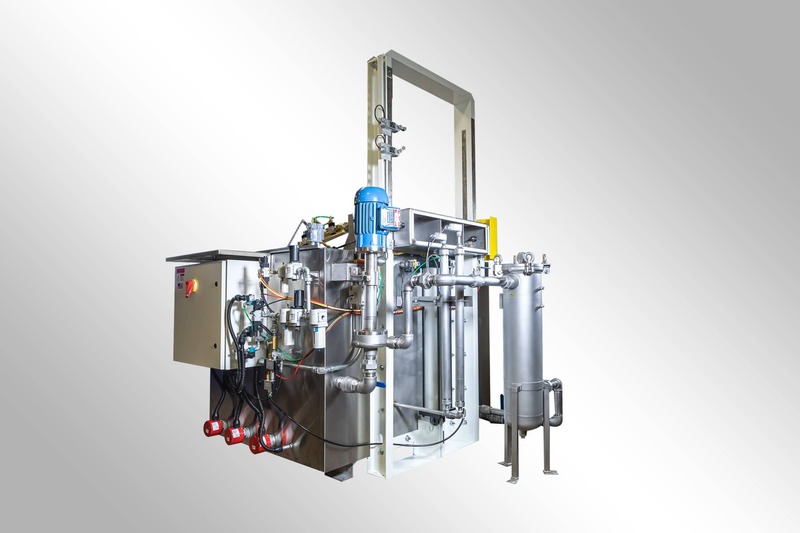 Our engineers have many years of experience providing integrated advanced soil removing methods such as hydraulic flushing at 20-240 strokes per minute, spray under immersion, ultrasonics, orbital rotation and more in addition to traditional heat and detergency parts cleaning. ACT’s unique combination of these technologies via the proprietary control system has evolved into Cyclic Processing for precision cleaning. 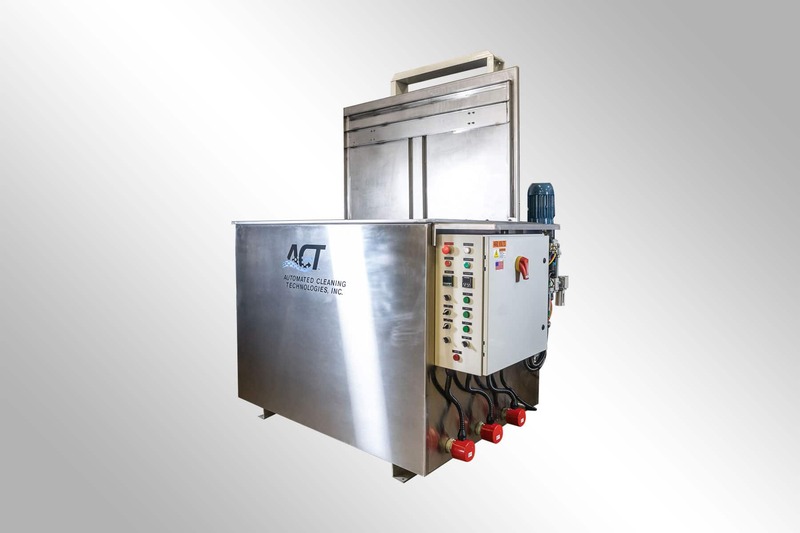 ACT knows that when it comes to PLC controlled ultrasonic parts cleaners, there really is a difference. In fact, our systems are truly unlike any off-the-shelf systems that flood the internet. What makes our systems your best option? Read more below and contact an ACT sales engineer today for a free consultation. An ultrasonic cycle at ACT is more than a few minutes of static “buzzing” in the tank. On the contrary, our systems deliver an alternating regimen of ultrasonics and gentle to aggressive (adjustable) agitation of the load at 20-240 strokes per minute. This regimen has been proven to remove greater soil quantities in less time. 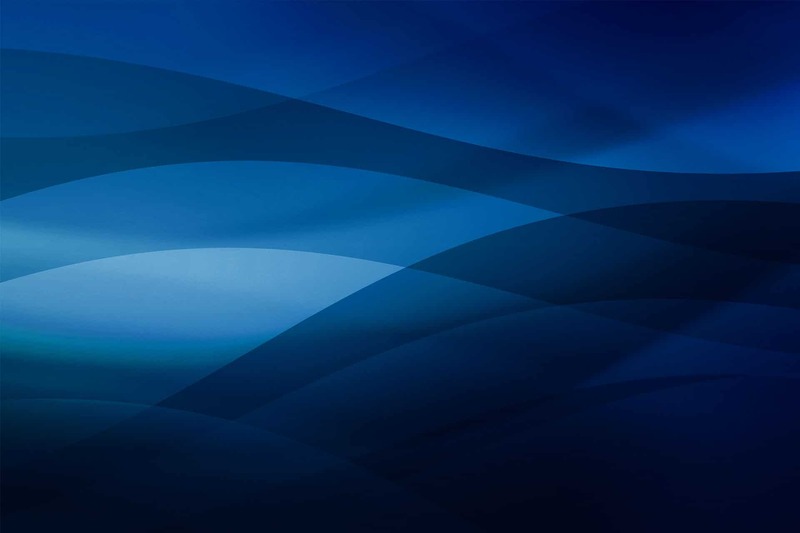 Our systems can be programmed to deliver any number of alternating regimens per wash cycle. 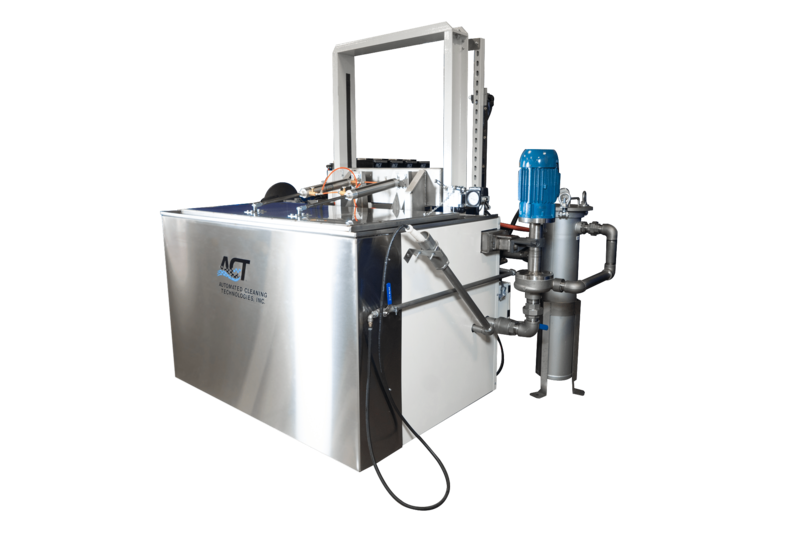 Modern cleaning systems built by ACT often are required to process numerous parts, with just as many process parameters. By storing recipes for these processes, our systems can be easily controlled to perform selected cycle operations at the touch of the screen; even the precise addition of detergent can be done from the HMI! Our systems are also well suited to robotic loading/unloading interface with the same controllers. This system was built for hydraulic component overhaul. Let ACT address your custom control requirements! Some parts have internal cavities that are fouled with carbon, dirt, and baked in soils. An airfoil from a power generating turbine is a prime example. Blasting the external surfaces of these parts is easy, but how can it be cleaned internally? The Automated Cleaning Technologies solution? 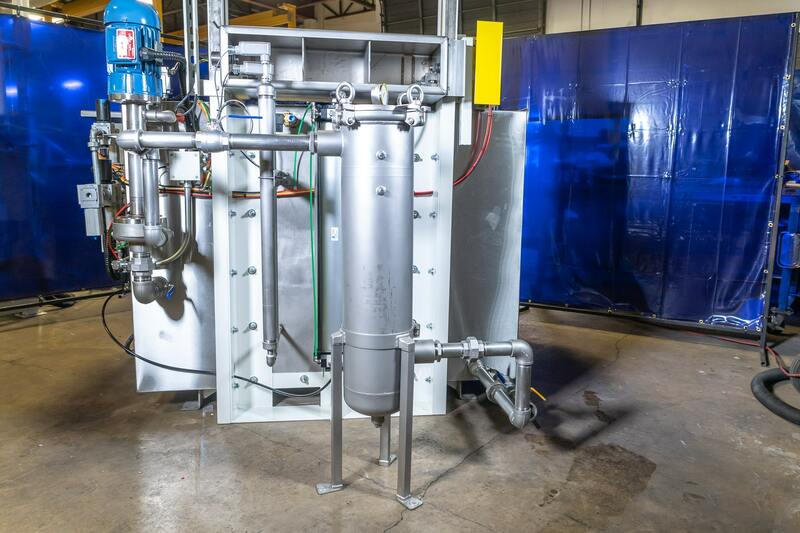 ACT can employ multiple technologies, which may include ultrasonic, positive displacement pumps and high pressure, heat, detergents, and a very creative control and plumbing scheme to push fluid(s) through parts in multiple directions. 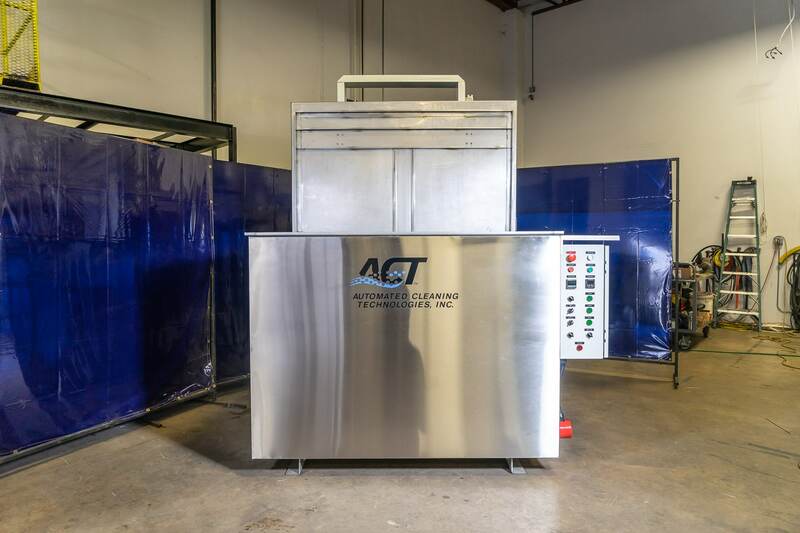 ACT has its own in-house machine shop and capabilities to machine soft-touch fixtures to secure the parts, while presenting the ports for pressurized bi-directional flushing. Extreme care is taken by our engineers to minimize volume blow-by and maintain requisite pressures for optimum cleaning. From micro volume flows and thousands of pounds of pressure, we can design and build a flushing system that exceeds your expectations.